Where is home? Nohal Wahby exhibits paintings soaked in layers of fluorescent colour depicting figures scattered across the canvas. Are they standing still or are they in motion? Hanan El-Sheikh and Khaled Akl participate with a captivating wall-sized painting of Tahrir Square, with matchsticks sprinkled among the crowd. Will it burst into flames? Visual artist Nihal Wahby had been concerned with the notion of freedom for many years before the uprising began in January 2011. She says her work gained its interactive and multidisciplinary qualities as a reaction to the revolution. The concept of freedom pervaded the lives of Egyptians, but perhaps most of all it pervaded the lives of artists, challenging them to think outside the “square” and to find alternative modes of expression. "It was very difficult to merely take a brush and just paint like I used to," Wahby explained at the artist talk held at 6 Contemporary Arts on Wednesday 17 April. "I wanted to try new things, I became very experimental." The artist says the pre-revolution period of her artwork was catalysed by a personal quest to define freedom. Yet the revolution materialised in her artwork as a collective existential crisis, in which the fears and hopes of an entire people were showcased. In this collection, the artist inundates hazily defined figures with colour that drips across the length of the canvases. In one painting, blue figures assemble in a circle amid a sea of pink hues; in another, multi coloured men and women are strewn across a massive white canvas, bathing in faint fluorescent colour. Wahby says the environment - the waves of resistance, hope, and change - were overwhelming. 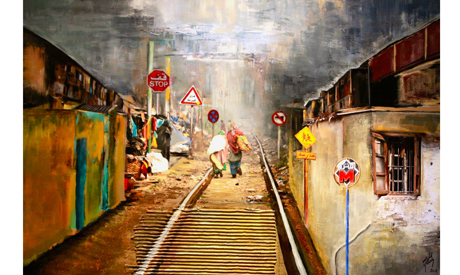 "My work reflects the changing dynamics of the street." To mirror the collective cry for freedom, the artist's work stared engaging the audience. A project she exhibited in November 2012 at the Hanager Arts Center entitled the Tower of Hopes and Dreams, which invited visitors to pen their dreams on paper and place it in a makeshift tower, embodied that shift in style. 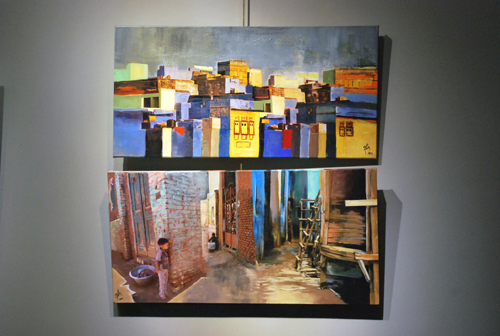 Nihal Wahby's canvases blend bright colours and feature multiple layers or washes of colour. But throughout, the figures steal your attention and tempt you to understand if they are standing still or constantly in motion. 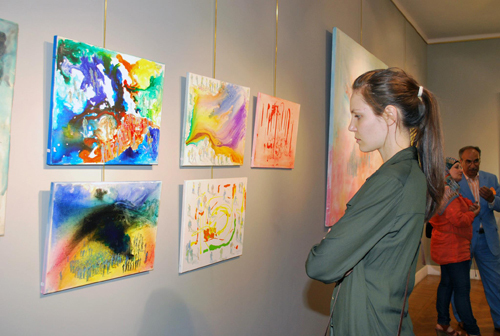 She explains that individuals are at the very core of her recent body of work. "I believe people are the catalysts for change; they are the source of all hope, movement, interactivity," Wahby says. While Wahby’s figures are always wandering in unidentified, faceless landscapes, Malak El-Shazly’s multi-media collages build elaborate, dynamic backdrops for her anonymous figures. Toying around with perspective, El-Shazly creates busy compositions depicting busy streets, bright skylines, or broken roads that make you wonder; where is this painting set? Despite the hints the artist leaves, like a chopped Burj Khalifa or the multi-coloured garments of Indian women, or the signs of Cairo’s Metro, these collages are decontexualized and therefore universal. Gallery visitors on opening night exchanged guesses about the geography of these pieces. To prepare for these works, which could be in Cairo, India, Dubai or Naples, El-Shazly flips through piles of magazines to choose random photographs that she ultimately weaves into a painting. Through creating multi-dimensional pieces, the artist challenges the viewers "to question how they view things." Not all the pieces in her collection depict scenes from nowhere that could be everywhere; a few paintings are based on true stories. El-Shazly's development work in a village on the outskirts of Cairo, Kafr Hamayed and in Geziret El-Dahab, where she set up multiple art workshops for children, and acted as fuel for her artwork. Photographs she took of the brightly coloured street decorations and buoyant children in these underdeveloped areas were catalysts for a series of charming paintings that contrast with her bustling cityscape canvases. In these collages, El-Shazly relies on a brighter palette to give light and life to these impoverished areas. She says photography isn't always enough to give people "a sense of the spirit" of these places. Like Wahby's work, El-Shazly allows members of the audience to read different stories into the paintings. The artwork in this exhibition does not impose one version of the city or of the community; they are all up for interpretation, and visitors responded by intently examining the paintings on opening night, as if expecting answers. Also enticing the visitors on opening night was a massive wall-sized painting co-produced by Khalid Akl and Hanan El-Sheikh, of the flammable symbol of Egypt’s revolution, Tahrir Square, with a surrealist flavour. The duo created a six-piece wall-sized painting of a Tahrir Square in the twilight zone, with matchsticks sprinkled across the space. This is the latest piece in what the pair dub a "transforming artwork," a project entitled “Wust El-Balad” or Downtown Cairo, revolving around Tahrir Square, which is presented in different forms in parallel to the political changes unfolding in the country. As opposed to the projects of the two other painters, which both deconstruct reality and do not impose a certain context, this project is a blatant representation of the iconic nucleus of the revolution, yet with a twist. 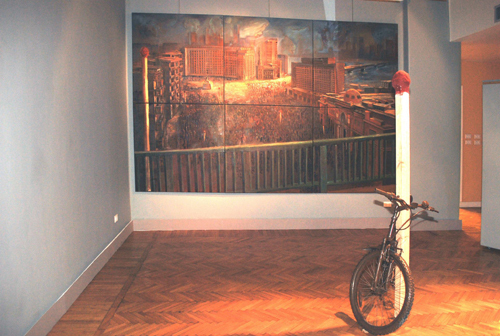 A larger than life matchstick and a bicycle drenched in brown paint are placed in front of the painting, mimicking the scene at the centre of the painting. Even though the revolution might not have achieved all its goals, in some aspects, it was a bonding experience. Egyptians have become hypersensitive to the community in which we exist, and living in an unfettered bubble is a luxury that is currently on hold. This exhibition highlights how the space in which we live has been forever changed by a monumental event that brought us together in some ways, and tore us apart in others.